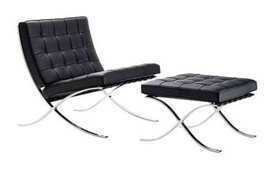 Ludwig Mies van der Rohe's Barcelona Chair and Stool (1929), originally created to furnish his German Pavilion at the International Exhibition in Barcelona, have come to epitomize modern design. 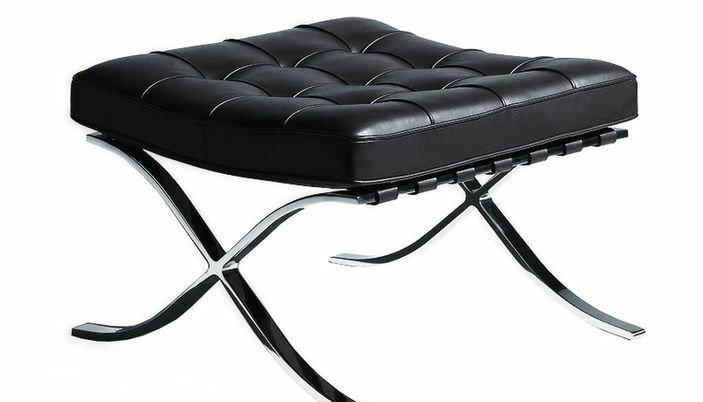 Mies van der Rohe designed the chair to serve as seating for the king and queen of Spain, while the stool was intended to accommodate their attendants. Still produced to his original specifications, Barcelona is of quality fit for royalty. The cushions – welting and buttons included – come from a single Spinneybeck Volo cowhide and are supported by cowhide belting straps, dyed to match the color of the stool. To create the deep, precise tufting, individual panels of leather are cut, hand welted and hand tufted. The chromed-steel frame is hand buffed to mirror-like perfection. 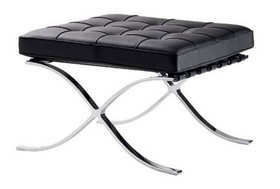 The Barcelona Stool is a registered trademark of Knoll®, Inc., manufactured by Knoll; according to the original and exacting specifications of the designer.